What do I do when planning a move for a family of five across the country? I obtain a nice bottle of red wine, a spread of decadent cheeses, grab some friends and do a little truffle recipe development. Because chatting with my girls, munching on Manchego, sipping Rioja and melting chocolate is infinitely more enjoyable than packing. 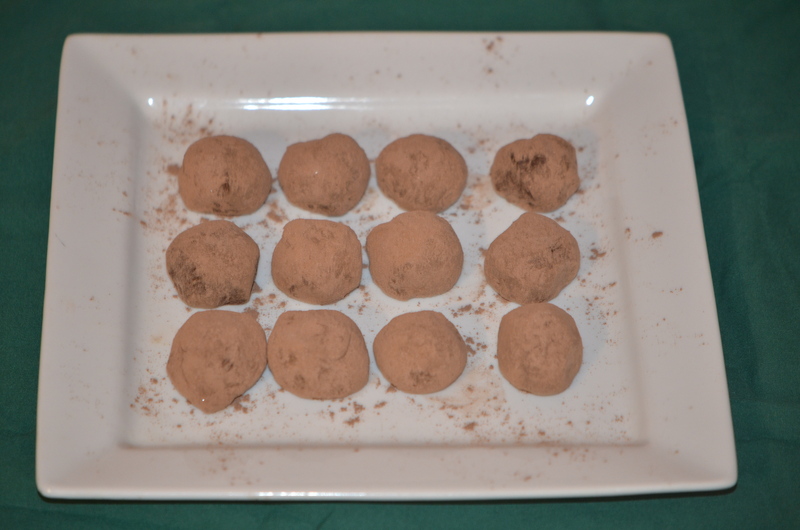 What I love about these truffles is that chocolate is the main focus. So many recipes have a lot of additives. Why? Just give me more chocolate in my creamy, decadent, flavor-balanced treat. Not too sweet, not too rich, the perfect amount of bitterness from the beans and cocoa. Just right. Life is always moving forward and a day never passes when there is nothing to be done. When there’s a lot going on, a scrumptious treat is oh-so-comforting and welcome. Of course. And, please, remember that a bit of coffee in a chocolate recipe only enhances the flavor. And, really, I just don’t say no to a robust coffee. Ever. Kind of like a nice red. My husband, despite incredibly long hours spent in the hospital as a surgeon, does not drink delicious coffee. We are a divided household. It appears this recipe is completely fine-tuned after a few astoundingly toothsome, appetizing endeavors. It’s a really hard life, eating all this rich, luscious dark chocolate goodness. Oh, wow, I had better get to packing for our big, fun family adventure to the friendly, gorgeous Midwest! Or maybe just make more truffles? Yeah, think option b is more palatable in more ways than one. 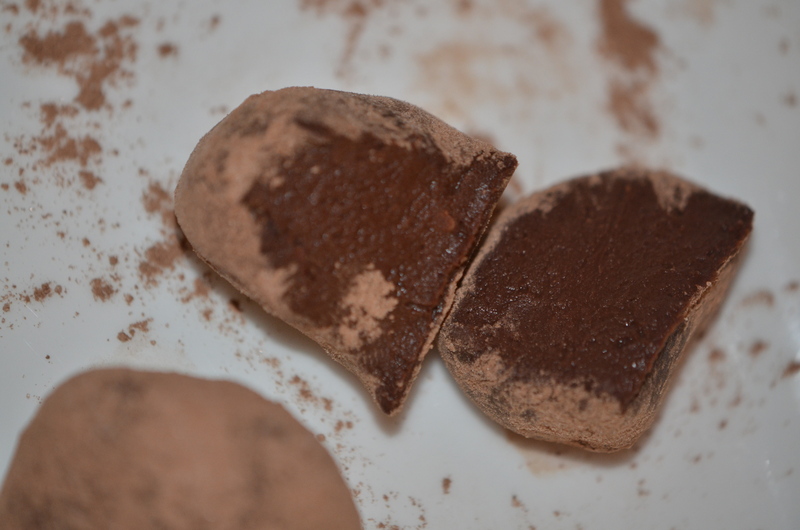 Melt the chocolate over low heat, stirring occasionally, using a double boiler. Or, use a medium-sized bowl to microwave the chocolate in 30 second increments, stirring after each increment. Avoid over melted the chocolate, which will continue to cook while you stir after each increment. Place the melted chocolate in a large bowl. Make sure your ingredients are room temperature. Use a wire whisk to stir in tahini, coffee or espresso, liqueur, nibs, and salt. Then, whisk in the cocoa powder. Start by whisking in four tablespoons of honey. Add the next four tablespoons of honey, one tablespoon at a time, just until the desired sweetness is reached. Refrigerate the mixture until very firm. 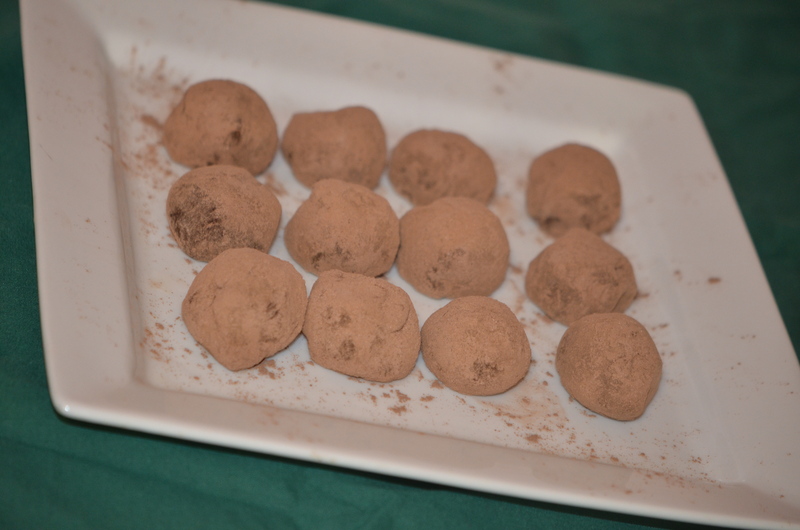 Roll the truffles into one to two tablespoon balls in your palm, using two fingers to form the shape. 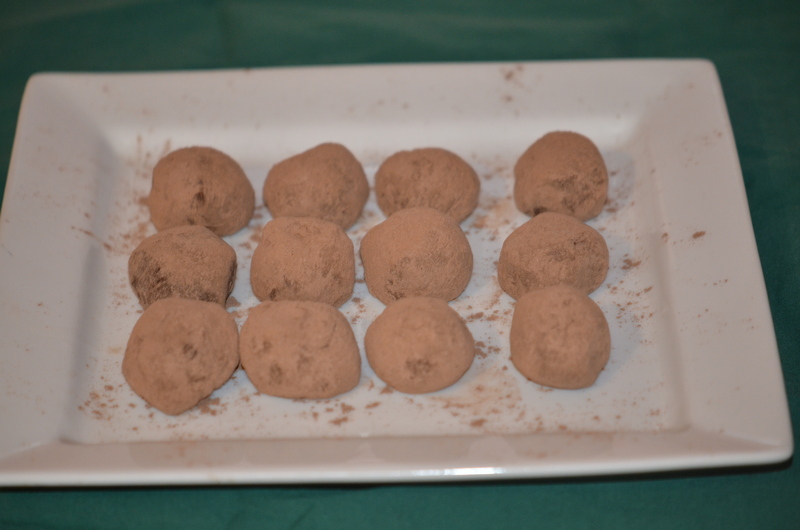 The size of the truffle is based on personal preference. 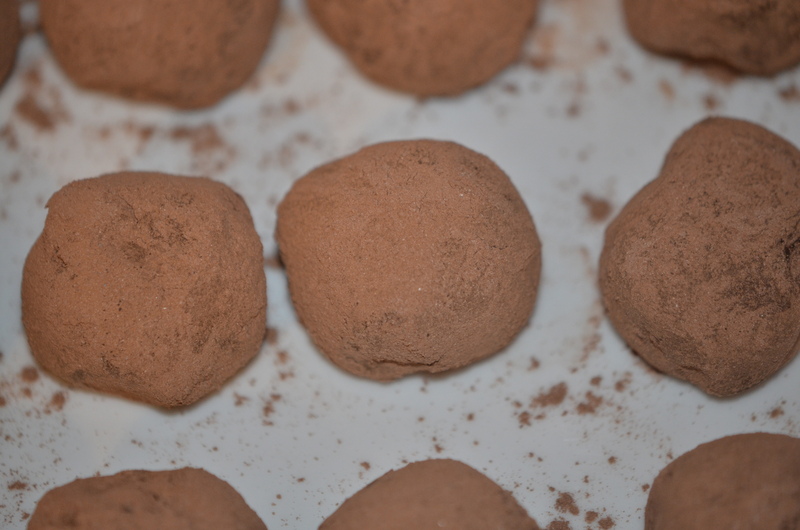 Smaller truffles have more sweetened cocoa (yum!). Refrigerate in Tupperware to keep fresh. Take care to place wax or parchment paper between each layer of truffles to retain their shape and delicious cocoa coating. ©Shanna Koenigsdorf Ward, shannaward.com (2013-2015), unauthorized use and/or duplication of this material without expressed and written permission from this blog’s author, Shanna Koenigsdorf Ward, and/or owner is strictly and completely prohibited. Posted in Chocolate, Dairy-Free, Gluten-Free, Healthy + Sweet Treats, lactose-free, RecipesTagged Chocolate, cocoa, coffee, Dairy-Free, dark chocolate, delicious, gluten-free, Healthy, honey, Kosher, lactose-free, Light, nibs, trufflesBookmark the permalink. I like the way you plan and pack! My favorites–Manchengo, red wine, and chocolate. Mmmmm mmmmm mmmmmmmmmmm! Big move Shanna, I think the Spanish themed wine and cheese and dark chocolate truffles sounds heavenly, Best of luck with the move/family adventure. I think of one of our similar family moves many years ago to a part of the country we had never been to. All success to you and your husband. Keep on bakin’! Oh, truffles! They’re decadent and addicting. Good luck with the move, Shanna. Best wishes to you and your family. I can tell you a lot about big moving… despite the stress and the hard work moving is also very exciting! It is a new begin, isn’t it? 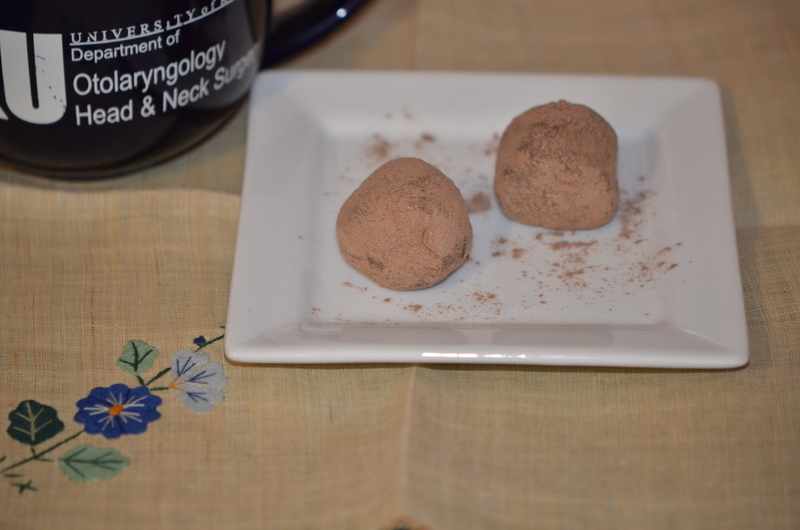 Good luck dear Shanna… but you are going to have a lot of good energy with these truffles! Truffles sounds lovely! Have you moved yet? You moved a family of 5 and I am complaining about my frustration of migrating my blog (finally got over the headache). I hope all is well and you and family, and happily settled. Simply damn delicious sweet bites!!! I love the use of the elderflower liqueur in here & the added espresso too! Yummm! This is art to be able to make such great espresso truffles. Wow! Great recipe. Thanks for sharing. The ingredients sound delicious, Shanna. Oops, no wonder I missed you, I must not have read carefully why you were making truffles, Shanna. At least you know I was here in July ♡ So glad you are settled in and hope sll is goung smoothly. I know how you must miss this nice group of women you had cheese, crackers and wine with plus delicious truffles. They had a sad going away gsthering, I am sure.